Scrutinize internal structures of your body by yourself! ANATOMIA is a Web based service not for doctors but for the rest of us who take CT or MRI scan at hospital. The service provides you with intuitive stereoscopic presentations of internal organs of your body for your health. Appreciate indispensable value of medical scan! CT and MRI are excellent instruments to produce three-dimensional data from human body non-invasively. The instruments become quite popular nowadays, and we have occasional chances to take the scans of the instruments. However, the images from the instruments are exclusively used by doctors, and meaningless to the rest of us. The doctors imagine stereoscopic shape of the organ of interest from multiple slice images, and judge the pathology. Nearly half a century has passed since CT became available for the medical tests, and this fundamental practice of doctor's has not changed since. We are in the age when computer drives a car without human interventions, and this common sense starts changing at last. CT and MRI are not instruments that diagnose diseases, but merely sensors. Doctor's high specialty skill is required to imagine stereoscopic structures from multiple slice images. However, if computer creates the stereoscopic structures, anybody can recognize their shapes. In order to generate stereoscopic shapes of organs, medical images are currently processed by special-purpose workstations at hospital. The functions are designed for professionals, and very difficult to use for ordinary people. ANATOMIA breaks the common sense, and provides the values of the medical images directly to patients. We implement advanced image processing algorithms on our Web server, and the server generates stereoscopic shapes of organs that anyone can recognize state of organs intuitively. Now, let's go through processes how to use this innovative service step by step. The first thing you need to do is to get your scan data from hospital in which you took the scan. You may think obtaining the data is difficult. But don't worry! The data is your personal information, and therefore, the person who took the scan has legal right to request disclosure of the data. Hospital should give you the data if you request! However, important point here is the purpose of the request you tell to the hospital. Typical cases of such request are to change hospital, or to look for second opinions from other doctors. In such a case, the hospital must compile all the medical records from a series of treatments, where the scan data is only a part of them. In order to discharge diagnostic information to outside of the hospital, the hospital may need to go through approval process from the managements. In such a case, it inevitably takes time and cost. On the other hand, if the hospital understands that you need the data only to study them by yourself, they just burn a CD ROM or a DVD with the scan data only. It will not take time or cost. Don't hesitate to request the data to the hospital where you took the scan. Once you get the scan data from hospital, next step is easy. Open your Web browser on your PC or tablet, and access Vocsis Corporation as you are doing now. When you click ANATOMIA key at the top of this page, "Login screen" opens as a separate window. On the screen, click "User registration" key, and enter a user arbitrary ID and e-mail address. Login to ANATOMIA using the ID and password that ANATOMIA send to you via e-mail. ANATOMIA is a subscription service, but you can use it for free for 30 days after registration. A scan produces hundreds of slice images. Mediums such as a CD ROM or a DVD you got from hospital usually contains a variety of information other than slice images. It also may include multiple datasets from multiple scans. ANATOMIA accepts one set of images corresponding to single scan in an uploading process. You need to find a set of slice images from the medium, but how? 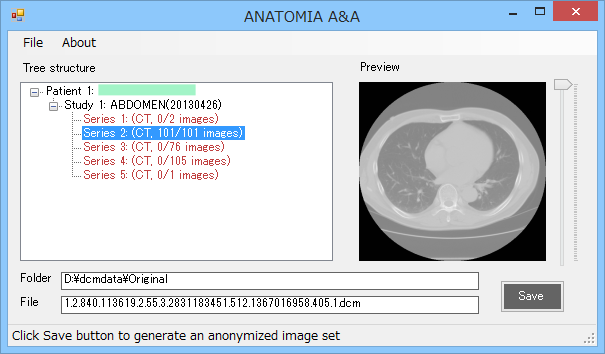 ANATOMIA provides a tool named ANATOMIA AA (ANATOMIA Analyzer. Anonymizer) that analyzes the contents of the medium, and specifies individual sets of slice images. ANATOMIA AA is a free tool running on Windows OS. It can be downloaded on "Upload screen". Install the tool to your PC or tablet. Run it, and find a file named DICOMDIR in the root folder of the medium, which is a requirement of the DICOM standard for the medium. ANATOMIA AA analyzes all the image files in the medium, and builds a tree-structure of image data sets in three hierarchical layers of Patients, Examination, and Series. By clicking a Series, a slice image of the set is displayed, and you can see what images are in the Series. Pick a Series that seems appropriate, and click "Save" button. ANATOMIA AA creates a new folder, and copies the set of slice images for uploading. At the time, ANATOMIA AA executes anonymization in that the personal information such as name, gender, and date-of-birth, as examples, are eliminated from the image files. By this way, your personal information is safe against vulnerabilities of transferring files over the Internet. 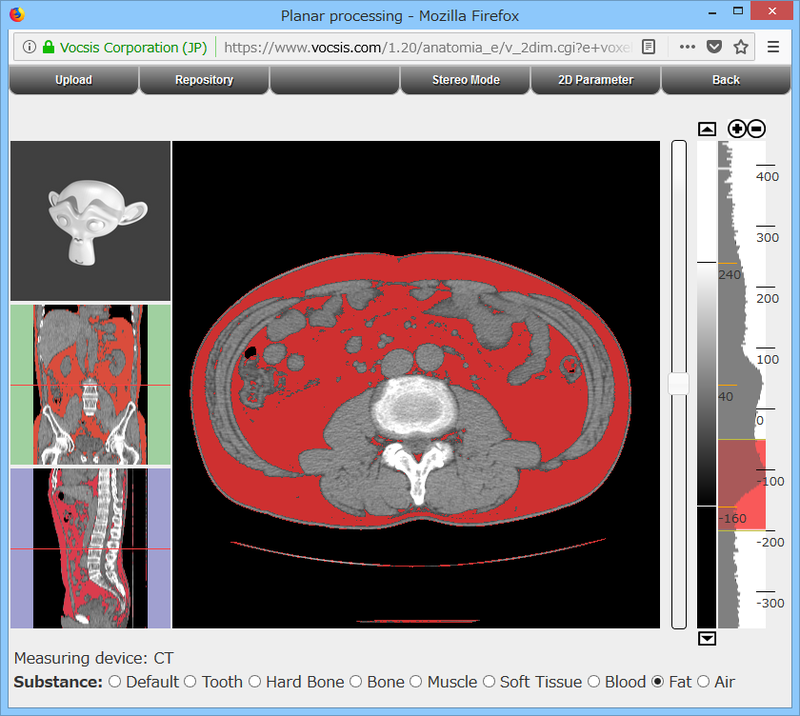 Upload the slice images on the "Upload screen" to ANATOMIA server. Because the size of a set of images is large, it may take long time depending on your Internet transmission performance. After the progress bar becomes 100 percent, the server takes some more time to create volume data, which is concatenated images. When the screen changes, and slice images are shown, the volume construction is completed. Give a descriptive name to the volume, and save it to your repository. From now on, the volume can be loaded immediately from the repository. In the planar mode, you can observe slice images in any of three orthogonal axes in a region of interest. In CT images, individual point of the volume has a value corresponding to the chemical substance at the point. You can see distributions of bones (calcium), blood (water), fat, air and so on. 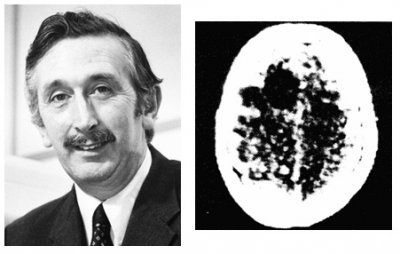 Medical images have much wider value range than that can be shown in a grayscale image. In order to make an image with adequate brightness and contrast to see specific organ of interest, a histogram of values on the image is shown on the right side of the screen. Change the value range called "window" that off-limit values are saturated either black or white in the grayscale image. In the stereoscopic mode, observe the stereoscopic shape as surfaces specified by a pair of thresholds in a region of interest. The surface model can be rotated, scaled and translated using mouse, so you can observe it from any direction. Once you get a surface model of organ of interest, give a descriptive name and save it in your repository. 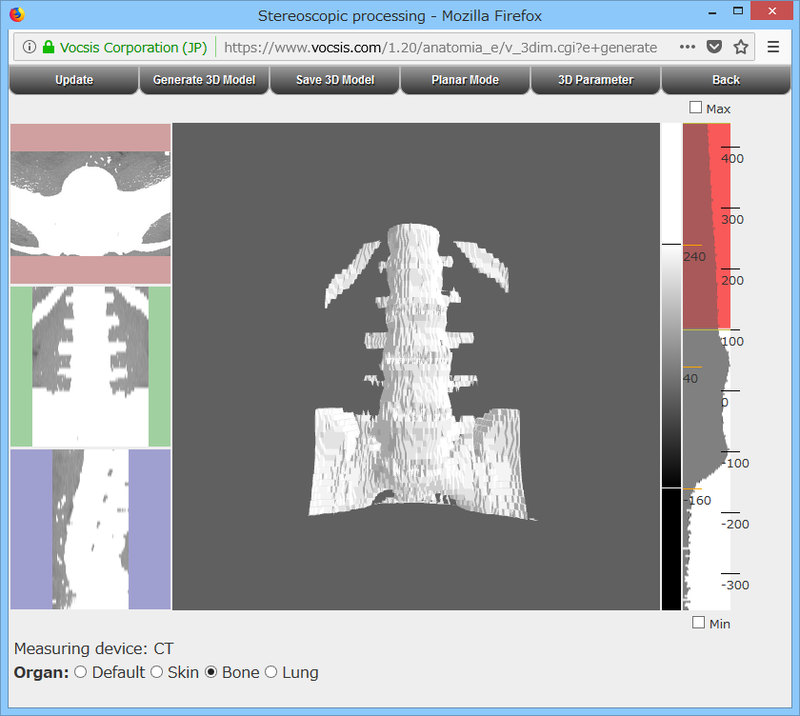 You can see some examples of surface models made by ANATOMIA on "Technology" page as "Structure samples". Explore your organs with straightforward and simple operation, and with self-explanative simplicity. Each internal organs has its own unique shape. You can find abundant information regarding to the relation between structural abnormalities and diseases by searching over the Internet. By experiencing ANATOMIA, you will realize that CT or MRI are excellent instruments useful to your health. The current ANATOMIA can smoothly reconstruct stereoscopic shapes of organs such as bones and lungs, which has distinctive boundaries. However, it may require try and error operations to see organs with soft tissues, such as stomach or heart. As ANATOMIA is an unprecedented service, it still needs technical development efforts. Vocsis is a proud company of advanced research and development. By implementing optimum distribution of processing between the server and your client terminals of PC or tablet, ANATOMIA established a mechanism always providing the latest functions to customers. Vocsis continues contributing our customer's health by improving ANATOMIA functions. Copyright (c) Vocsis Corporation 2015 - 2019. All Rights Reserved.